Frostpunk: Console Edition Announced | Nerd Much? It was just about a year ago when 11 Bit Studios dropped Frostpunk on PC. We thought it was great! But the society survival sim was for PC only, leaving console owners out in the cold. It sounds like the developers have spent the last year or so working toward more versions of the game though, as Frostpunk: Console Edition has been announced for later this year. 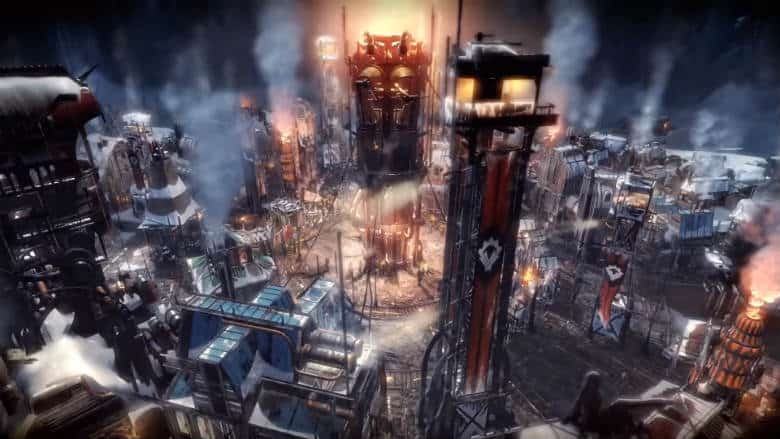 If you’re unfamiliar with the game, Frostpunk is set within an alternate take on the 19th century industrial revolution. Our planet mysteriously freezes, ending civilization as we know it and forcing humanity to find a way to survive in the harshest of conditions. In the game, you become the leader of one of humanity’s last colonies. You’ll have to “build the city your survivors live in, discover new technologies, explore frozen wastelands and most importantly, manage and rule society to prepare it for life in an unforgiving world.” But whether you do that with an iron fist or a gentle demeanor is entirely up to you. It wasn’t just Nerd Much? that loved Frostpunk’s take on the strategy genre. It was an overall critical success with a Metascore of 84, consisting of 93% positive reviews and zero negative. And the title was even nominated for Best Strategy Game at 2018’s The Game Awards. Though it ceded the win to Subset Games’ Into the Breach. 11 Bit Studios didn’t give a first release date for the Xbox One and PlayStation 4 version of their game. Only teasing that it will be arriving for the consoles sometime this summer. Though they do confirm that all of the free updates and scenerios that have come to PC will be built into the Frostpunk: Console Edition too.